I am taking a seminar this semester where we discuss the ICZN – the International Code of Zoological Nomenclature. It’s basically all the rules for naming animals. If you think naming species is a simple process, and probably not that important anyway, you are about to be proven wrong. And if you think there is no way people could possibly get excited and have loud heated arguments about the rules regarding how to name species… well… just wait and see! I will write posts about what we discuss periodically through the semester. But first, some history. And… why do we need a code, anyway? I bet you can imagine that if anyone could name a species anything they wanted, we’d have at least two dozen species named “Darth vader” (and there is a beetle named Agathidium vaderi due to its black shiny head and eyes). According to the International Commission on Zoological Nomenclature, “The objects of the Code are to promote stability and universality in the scientific names of animals and to ensure that the name of each taxon is unique and distinct.” There are also separate codes for plants, cultivated plants, and bacteria with the same goals. Naming a species might seem like a once-in-a-lifetime dream to a child aspiring to be a world-famous scientist (a.k.a. me when I was 10 years old), but in reality it’s commonplace for many scientists, especially those studying insects and other invertebrates. My advisor can’t even remember how many species he has named. Heck, I’m naming one right now, and I’m only a lowly graduate student. There are millions of species out there yet to be discovered, and they are not all in tropical rainforests – you probably have an undiscovered species living in your backyard. It might be a nematode or a gnat, but hey, it counts! And when you discover that species, there are rules that should be followed for the name to be stable, unique, and universal. You might also want to consult naming regulations when splitting one species into two, or when lumping two species together. These decisions are not arbitrary, but done to reflect new knowledge and understanding of the biology, ecology, and evolutionary history of animals. Animals have been given names for as long as we have had language. However it was not until Linneaus’ binomial (two name) system that species were given permanent, universal names that everyone could use. 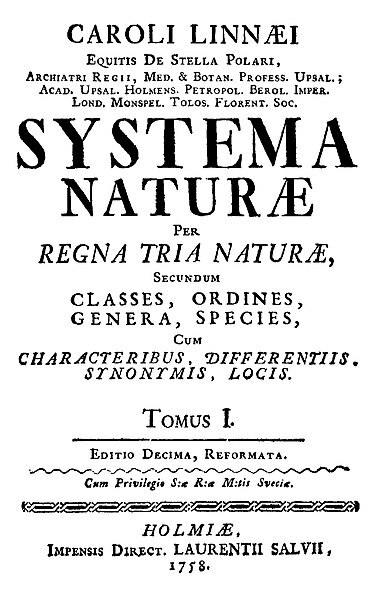 In 1735 he published Systema Naturae, which was updated until the last edition in 1793. As taxonomy gained momentum in the 1800s, chaos was unavoidable – how do you reconcile the opinions of scientists from different fields, and from different countries around the world? Duplicate names were used, species were moved in and out of genera without realizing (or acknowledging) the work of others, and misspellings were rampant. Just imagine trying to find research from other countries without the internet! In the 1800s several competing “codes” emerged. the British Association for the Advancement of Science created a committee (Strickland, Darwin, Owen, and Henslow) to come up with the Stricklandian Code (1843). Meanwhile the Kiesenwetter Code was created by Dresden in Germany (1858). American ornithologists created a code based on the Stricklandian Code in 1866. Each had differences and overlap in their recommendations, though no scientists were obliged to use any code in particular (or any code at all). Finally in 1895 the International Commission on Zoological Nomenclature was founded – with the goal of creating a universal code. The first commission in 1897 had five members from five countries (today they are up to 28 members from 20 countries). They started with lists of recommendations, but it took a long time for the first official code to be published, the first edition was not published until 1961! Since then there have been three revised editions; the fourth edition was published in 1999 and is still in use today. The fifth edition is due in the next year or two, in order to address concerns about online publishing. If you want to read the code yourself, you can find it here. The next “adventure in taxonomy” will be about types, and some of the fundamental rules in the code. Posted on February 28, 2013, in Adventures in Taxonomy, Invertebrates and tagged entomology, iczn, nomenclature, systematics, taxonomy. Bookmark the permalink. 3 Comments. This is fascinating, though I must admit that this is probably the first time that I have seen the words “adventures” and “taxonomy” used together. Even the professors were taken aback by my enthusiasm, haha. But it really is a fascinating field, because when you get right down to it, so much of our knowledge hinges on knowing things by the correct name. See if the ICZN can sort out the correct scientific name for the False Comma (Comptons Tortoiseshell) while you’re at your seminar! I’m trying to write an article on this butterfly and it appears whatever you call it you’ll upset someone! ICZN don’t accept the name Nymphalis vaualbum ([SCHIFFERMÜLLER], 1775) considering it a nomen nudum preferring the name Nymphalis l-album (ESPER, 1780)…but many other organisations including The Fauna Europaea, prefer using the name Nymphalis vaualbum believing rejection of this name would, in the end, lead to the rejection of so many names… which would be very unfortunate for a stable nomenclature of European Lepidoptera!